Draping and ceiling decor are the ultimate finishing touch and can totally transform a room to create a romantic look or to reinforce your wedding theme or style. Draping is one of the most dramatic and cost-effective decorations for your wedding reception as no other decorative element has as much impact for the amount of money spent. Ombre room draping in purples! Draping can be used for the entire room, to create divisions in a large room or to hide unattractive curtains or features. The drapery style and ceiling type will affect the items needed for installation, and, coupled with a few well-chosen ceiling decorations, your wedding venue can sparkle with charm and elegance for your big day! Please call 231-755-1805 for an appointment to get a quote for full ceiling draping. 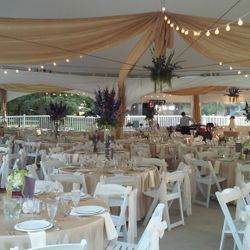 See our selection of chandeliers available for your ceremony or wedding reception.